Pot roast lunch specials and sweet tea still were being served at the Air Park Cafe on Wednesday, a day after the owners of the Downtown Airpark told employees not to come back to work. The offices of the airpark’s owner Dave Amis III remained locked, and staff at the cafe fielded questions about the future of the airpark, at 1701 S Western, adding more questions of their own. Kay Lundy’s mother opened the cafe adjacent to the runway in 1954 and has shared a building with Downtown Airpark’s offices since then. She doesn’t know what will happen to her restaurant and declined to comment on its future. Hangars that once were brimming with airplanes and maintenance workers were shuttered and the runway southwest of Oklahoma City’s downtown was quiet. At Downtown Airpark’s corporate jet offices at the Clarence E. Page Municipal Airport near Yukon, doors were locked and employees were gathering their belongings. They, too, were told the money had run out and they would no longer have jobs. After layoffs in March, fewer than 50 people were working at both of Downtown Airpark’s facilities. Amis, whose grandfather W.D. “Bill” Amis along with Dean A. McGee opened the airpark in 1947, said the hits the aviation industry took after the 9/11 terrorist attacks hurt his business. Meanwhile, airplane owners who store their planes at the airport on Western are looking for new space. Landings and takeoffs at the airport will continue, but pilots will have to fly to another airport to refuel. Auxiliary business at the airport also will be searching for a new location. Dennis Kirkpatrick, the son of the founder of Kirkpatrick Electronics said the closing of maintenance operations at the Downtown Airpark leaves his avionics installation and repair business hanging in the balance. Over the years, Downtown Airpark has experienced financial woes and has been sued by vendors and aircraft leasing agencies for nonpayment of debts. As of Tuesday, the company had not paid the $3,529 rent payment on its office at Clarence E. Page, which is owned the by the city of Oklahoma City. The company has been a tenant there since 1995 and has a lease on the office building and two hangars through 2010, said Luther Trent, director of the Oklahoma City Airport Authority. Trent said his office has not received word that Downtown Airpark plans to leave the facilities at Clarence E. Page. Amis said he and his family have not decided what they will do next. Property records at the Oklahoma County Assessor’s office show that land is worth at least $1.4 million. The property adjoins the Oklahoma River and is near more than $52 million of new dams, trails, landscaping and parks meant to make the river a scenic waterway. A master plan for the Oklahoma River says the airpark could be developed into housing. The airpark is about a mile from the new Dell sales and service center that is expected to employ up to 3,000 people. Maintenance and refurbishment operations ceased Tuesday at the Oklahoma City Downtown Airpark, but the owner says landings and takeoffs will be allowed to continue until further notice. The Oklahoman has learned the shutdown leaves up to 75 people unemployed. Dave Amis III, airpark owner, confirmed the closing but did not disclose how many people were losing their jobs. "It's an emotional deal; it's painful," Amis said. The park, 1701 S Western Ave., was opened by W.D. "Bill" Amis with backing from oil exploration pioneer Dean A. McGee in 1947. Back in the heyday of the early 1980s oil boom, business at the park topped $20 million. As recently as the mid-1990s, the airpark employed more than 140 people. A former employee who asked not to be identified said the airpark employed about 75 people as of late 2004. The airpark's operations included maintenance and refurbishment on several different types of airplanes, including the Aero Commander, King Air, and other piston and turbine powered aircraft, including helicopters. The helicopter unit for the Oklahoma City Police Department is based at the airpark. The maintenance center also performed periodic checks on airplanes required by the Federal Aviation Administration. Property records at the Oklahoma County Assessor's office indicate the land is worth at least $1.4 million. Amis said Tuesday business has been much slower but declined to provide further details of the airpark's financial situation. State airport inspection reports show that the airport reported 7,500 landings and takeoffs from March 2003 to March 2004. That number is up 500 from the previous year. The airpark adjoins the Oklahoma River and is south of downtown. Over the past several years Oklahoma City and U.S. Army Corps of Engineers have spent more than $52 million on three new dams, trails, landscaping and parks aimed at turning the river into a scenic waterway. A master plan for the Oklahoma River indicates the airpark could be redeveloped eventually into housing. The airpark is within a mile of a new Dell sales and service center expected to employ up to 3,000. Its proximity to downtown also makes it a convenient airport for pilots, said Lynn Pinson, airport inspector for the Oklahoma Aeronautics Commission. "It's a handy airport for people going to downtown or the Ford Center," Pinson said. "You can grab a taxi and be there in minutes. It would have a significant impact if it were to go." Amis said he has no immediate plans for redevelopment of the property. "There are so many wide-eyed plans for what could go on out there," Amis said. Any pilot or passenger who has flown into or out of Downtown Airpark will attest to the "pucker factor" during takeoffs and landings, and it's not the downtown buildings. There are canals at either end, dense neighborhoods and vertical obstacles, so mistakes are very unforgiving. Even though fixed-wing operations are rumored to be ending soon (the I-40 realignment will move the highway too close to the approach end of RWY 16), the OCPD helicopters will still use it. But what will become of the site? Any guesses? I did not see this posted anywhere in OKCTalk, yet. Speculators interested in turning the acreage of a defunct airpark into a riverfront development got a nod Friday from a state judge overseeing the foreclosure case of the Downtown Airpark. Judge Daniel Owens approved a motion that allows prospective buyers to make bids on the 80.6 acres of land just west of downtown Oklahoma City to help pay off the debts of Downtown Airpark Inc. The corporation owes more than $5 million to creditors, with its largest creditor being the Archer Trust, a California-based trust. Downtown Airpark Inc. was owned by contractor David Amis III and river front development consultant Pat Downes when it ran into financial difficulties. Records show Archer Trust registered to a California address bought by Titanic producer James Cameron in June 2004. An attorney for the Archer Trust refused to comment on the pending litigation. Court filings show that the Downtown Airpark failed to pay four mortgages including a $650,000 loan from Suzy Amis Cameron, Amis' sister and Cameron's wife. According to the Oklahoma Department of Labor, Downtown Airpark also owes $193,287.12 to employees who lost their jobs when the airpark closed in May. In June, the court appointed David Rhoades as the receiver in the case. Since then, the airpark's assets and inventory have been sold. Rhoades said he expects the sale of the land, a prime location for continued downtown development, to be lucrative. "There is a lot of interest," he said. "I think we will get enough to pay off the taxes and the mortgage." Court records show Rhoades has fielded at least a dozen inquiries on the airpark -- most of them involving plans to convert it into housing. Past inquires also have included a member of the Seminole Nation who expressed an interest in turning the airport into a casino. Those confirming they are still interested in the property include former Oklahoma City Mayor Kirk Humphreys and his sons, Grant and Blair, and Howard Pollack, who promotes shows at the Zoo Amphitheater and Farmer's Market. Neither Humphreys or Pollack would say what they might do with the property -- though court documents show Pollack proposed building an entertainment complex. Other inquiries include a pitch by Tom Parrish to develop the area into "Hispanic housing." Records show Rhoades also was contacted by developer Richard Tanenbaum, whose downtown area residential projects include The Montgomery, The Classen and the Park Harvey Apartments, and Bert Belanger, who along with Anthony McDermid and Pat Garrett are developing the Triangle town center project. McDermid confirmed Belanger contacted Rhoades, but they are not bidding for the airpark. Tanenbaum said he lost interest after concluding the property's financial affairs were "all messed up." David Bohanon with Blackstone Commercial Reality, and former publisher and development consultant James Durocher confirmed they too contacted Rhoades about buying the airpark, but are not placing bids at this time. More sales inquiries listed by Rhoades included a person identified as Jenov Igochan, broker Gerald Gamble and Norman contractor Gail Armstrong. The three could not be reached for comment Friday. The airpark, which included hangar space and an aircraft maintenance facility, shut down May 31. Airplanes stored at the hangar had to be removed by Aug. 31. The airpark was started in 1947 by W.D. "Bill" Amis and Dean A. McGee. The landing strip was ideal for pilots wanting to be close to the downtown area. Members of the Amis family say a loss of business after the 2001 terrorist attacks hit them hard, but court records show financial difficulties began earlier. Jim Hasenbeck, a partner with Studio Architecture who did the master plan for the Oklahoma River, has said the airpark site is a prime development spot because of its view of the downtown skyline and proximity to the new Interstate 40 Crosstown Expressway. Thanks for posting this article and not creating a duplicate thread on topics that have previously been discussed. Hmmm...sounds like a good idea for the airport. We have plenty of regional airports. I'd love to see this airpark turned into a nice development close to the Oklahoma River. How about a museum honoring the great aviation folks from the past? Will Rogers? Wiley Post? Clarence E. Page? Once central aviation museum. Can include history about Tinker and its relationship to OKC, history of aviation in Oklahoma, etc. Aviation Hall of Fame? Any takers? Or we could always sell it to Harrah's and start our strip of casinos on the river. A casino is out and mixed-use development is in for the former Downtown Airpark after a winning $7.2 million bid Thursday by developer Grant Humphreys. Humphreys, whose partners include his brother Blair and father, former Mayor Kirk Humphreys, said Thursday they are buying the airpark because of its proximity to downtown, the Oklahoma River and the realigned Interstate 40 Crosstown Expressway, and they will block any attempts to turn it into a casino. "In the next four years, as the I-40 realignment becomes a reality, this property will become a critical component of the river's redevelopment," Grant Humphreys said. "We're big believers in downtown's continued growth and success." Receiver David Rhoades, appearing in Oklahoma County District Court on Thursday, recommended the bid over others that included parties interested in developing the 81-acre property into a tribal casino. Rhoades said the Humphreys bid was chosen because it met "all the rules" and not because of development plans. "The deal was to accept the highest and best," Rhoades said. "There were certain rules that the judge set forth in the order. Some of the people didn't comply with the judge's rules -- they either didn't put cash up front or didn't have a contract that was acceptable." Rhoades said a closing will occur within 30 to 45 days -- and added he has no concerns the deal won't be completed. The Humphreyses and partner Robbie Aduddell, whose family owns Aduddell Roofing, submitted a $100,000 check and signed a contract as part of their winning bid. The Downtown Airpark closed in May and went into foreclosure owing "in excess of $7 million" to creditors, including actress Suzy Amis and a trust connected to James Cameron, Amis' husband and producer of the movie "Titanic." Downtown Airpark Inc. was owned by contractor David Amis III and riverfront development consultant Pat Downes when it ran into financial difficulties. The property is along the west side of Western Avenue and the south shore of the Oklahoma River. After the realignment of I-40, Western will be the only "full diamond" intersection in downtown, meaning east- and west-bound can both enter and exit the interstate at Western Avenue. Highway mitigation plans include creation of a large green space on the north side of the river adjacent to the airpark. "We became interested in the property because of its great views of the downtown skyline and prime riverfront location," Aduddell said. "It's by far the biggest single development site in close proximity to downtown." Grant Humphreys said they envision a mixed-use master-planned development that could include offices, housing, hotels and retail. He said a master planner will be hired within the next year. Blair and Grant Humphreys promised a casino won't be a part of the development. "We believe that a corporate anchored mixed-use development will be the highest and best use for the property," Blair Humphreys said. "This will build on the success of MAPS and be another boost to the momentum of downtown Oklahoma City." It seems there is new development for downtown and the surrounding area every week now. I wonder when out of state developers will jump in? That's a great spot for this. I am beginning to wonder though what the limit is for so-called "mixed use" development. It seems this could just dilute these efforts in downtown. I'm not knocking it, but I would like to see somone propose something that hasn't been proposed before. That would be a great location for a boardwalk type development. Sounds excellent to me. Could be a great place for a major hotel. And there's nothing saying this can't include a boardwalk type retail development. I'm pleased with Humphreys Block 42 and i'm very optimistic about this. Engaging park space, one or two residential towers, and some supportive residential retail would be nice there. I agree with BDP that office space would be tricky competing with downtown. Would it be considered CBD? Or South? I like that the Humphreys are leading it. I remember seeing the concept sketches they came up with a few years ago, almost seemed out of reach, but it's actually happenening now. 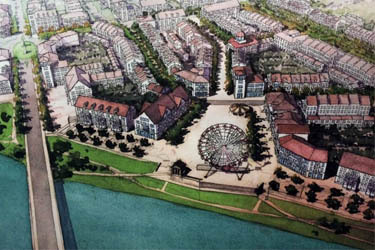 Also, read their plan for the entire waterfront. It shows the masterplan for the separate areas. Kind of puts OKC's and Tulsa's masterplans to shame. That's a nice plan for Portland. I still like ours done by Studio Architecture. I still look forward to seeing this project come to life. If this project is conceived with the same sensibilities as Block 42, I think we're in for a treat. I hope the authority remembers that the river is a natural resource first and a development opportunity second; and that Humphreys et al will follow the standard set by the Cheseapeake Boathouse. What plan was done by Studio Architecture? I sure like to see it. I really like this plan. I think it's interesting that it says CO-OP ICONS. Are those really considered icons, or something worth saving? About the airpark though, this could be the first major implementation of the River Plan shown above. Good examples of successful urban airpark conversions include the Stapleton development in Denver and the Mueller development in Austin. OKLAHOMA CITY - Aduddell-Gibraltar Partners LLC offered the winning bid of $7.2 million for the former Downtown Airpark at the Oklahoma County District Court on Thursday. The closing is expected to happen within 30 days. Managed by Grant Humphreys, the group is composed of the principals of Aduddell Cos. and Gibraltar Investments. The 81-acre riverfront property just south of the Oklahoma River and west of Western Avenue will be held for three to five years while Interstate 40 is realigned and owners decide on a master plan, Grant Humphreys said. "We believe that a corporate anchored mixed-use development will be the highest and best use for the property," partner Blair Humphreys said. Robbie Aduddell, partner in the purchasing group, agreed. "With over 80 acres, a quarter of a mile of river frontage and great access to the new interstate, this is the best location for the next Dell," he said. "Our city is definitely on the map for growth and economic development." The group is also considering a restaurant row and hotel, Grant Humphreys said. Once the realignment is complete, Western Avenue will have the only "full diamond" intersection in downtown Oklahoma City, which means both east- and west-bound traffic can enter and exit the interstate at Western Avenue. Downtown Airpark Inc., which was composed of W.D. Amis Jr., W.D. Amis III and Pat Downes, who had a small interest, owned the property prior to Aduddell-Gibraltar Partners. In May, the airpark closed and Downtown Airpark Inc. faced financial challenges, owing more than $7 million to creditors. Downes, who is also the director of development for the Oklahoma City Riverfront Redevelopment Authority, had only positive things to say about the acquisition. "(They are) solid, civic-minded and visionary in their approach," he said. "I think for such a parcel to be owned by a local interest is such a real benefit. They understand the importance of protecting and building on that public investment. It creates jobs, stimulates the economy and revitalizes a largely ignored and, in some sectors, a blighted part of town." Are those really considered icons, or something worth saving? No. Once 40 is relocated, that land will become quite a bit more valuable and the eyesores will be moved elsewhere. I think it will be interesting to see the development between the current downtown/bricktown and the new 40 and along the 'boulevard'. I had previously proposed that the co-op area be razed and made ready for a stadium or higher and better use, but many on this site seemed to want to save it through adaptive reuse. I've always thought it was an eyesore and that it leaves a bad impression of OKC and was surprised that so many felt differently. However, I can certainly understand the hesitation to tear anything down after the massive mistakes the city made in the 60's and 70's. That looks like a great master plan. I just hope that at least some of it get implemented, and it all doesn't get hokey-ed up. I will be anxious to see a master plan for the downtown boulevard that will replace I-40. This is a tremendous opportunity for the city to create a high traffic artery through downtown that is also very urban in scale with lanes on each side dedicated to on-street parking, extensive landscaping, wide sidewalks, and numerous retail businesses. It already will have the theater along it and the Ford Center as well, there could be a lot of infill in between those two and beyond towards the derelict lower end of the Arts District. You can see the master plan. I'm not sure if anyone has posted it on this site but I believe you can find it on COTPA's or DOT's website.